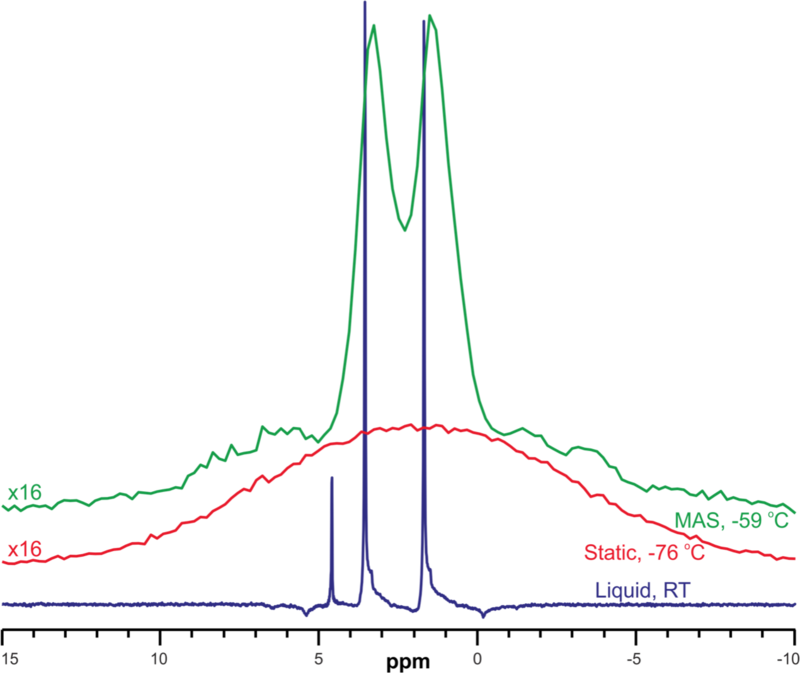 Comparison of liquid state spectrum of 1:17 mixture of THF:99.9% D2O (blue) before hydrate formation, static NMR spectrum of THF·D2O hydrate (red), and MAS spectrum (green). The temperatures at which spectra were recorded are shown on the right. The hydrate spectra have been enlarged by a factor of 16 for better visualization. Clathrate hydrates are a class of compounds in which small guest molecules, such as oxygen, methane, ethane, tetrahydrofuran, etc. are encapsulated within a hydrogen-bonded host water cages. It can be formed when the guest and host come into contact under appropriate temperature and pressure condition. Vast deposits of natural gas clathrate hydrates, mainly methane hydrates, have been widely discovered in deep ocean and permafrost over the recent years. The inventory of methane hydrates is estimated to be comparable to coal, oil, and natural gas. Thus, clathrates have received great interest as a potential alternative energy source in the future. In clathrates, the whole water molecule network is linked by hydrogen bonding which also forms cavities to encage guest molecules. Due to the van der Waals forces from guest molecules, different water cages form two major types of crystal structure of clathrate hydrates, cubic structure(CS) I and II. The basic building block of CS-I and CS-II is a pentagonal dodecahedron (512) which has 12 pentagonal faces. The clathrate hydrate structure is often recognized by the connection of these cavities. In CS-II structure, the building blocks are joined to each other through face sharing, and it has sixteen 512 cages and eight larger 51264 cages incorporating a total of 136 water molecules in the unit cell. Within the cages, small guest molecules are trapped with limited translational mobility but may retain rotational and vibrational freedom. From the standpoint of physical chemistry, these unique structural properties combined with their relevance as a potential energy source, make clathrate hydrate a fascinating system for study. While the structures of clathrate hydrates are well characterized through X-ray diffraction and static solid state NMR, the dynamics of the host and guest molecules are not clearly understood. Evidence from X-ray and static solid state NMR (ssNMR) suggest that the guest molecule has considerable motion with a low activation barrier to the motion, but the specifics of the motion are not well understood. Tetrahydrofuran (THF) and cyclopentane (CP) can both form cubic structure II (CS-II) type clathrate hydrates when mixed with water in a 1:17 stoichiometric ratio. The guest molecules only occupy the large 51264 cages and leave the small 51262 cages empty. Both tetrahydrofuran (C4H8O) and cyclopentane (C5H10) are five membered rings of similar molecular weight. However, tetrahydrofuran has an oxygen atom which is capable of forming hydrogen bonds. In this work, Magic Angle Spinning (MAS) solid-state NMR is employed to study the dynamics of guest-cage interactions in THF and CP clathrate hydrates. In order to reduce the broadening of the guest proton signals, degassed 99.8% D2O was used instead of water for preparing the samples. The advantage of doing MAS NMR over static NMR is clearly seen from in the figure above. 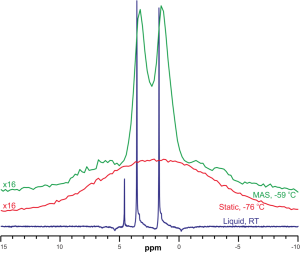 MAS NMR can resolve the two signals from the THF, and a sharpening of the lines leads to better signal to noise ratios. From this direct comparison between THF and CP clathrate hydrates studies, the differences in guest-cage interactions, especially the formation of hydrogen bond, will be revealed in the future. This project is also closely collaborated with Prof. Janda.